Artenara "Beyond the Beaches of Gran Canaria"
Artenara, a typical village of Gran Canaria, is the highest town on the island and contains many inhabited caves. 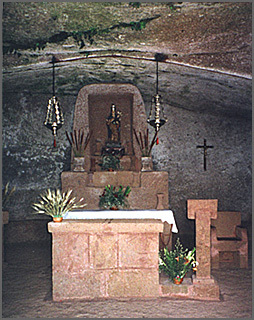 The main attraction is Santuario de la Virgen de la Cuevita, a cave church. It was used by the original islanders for worship and was transformed into a church by the Spanish at the time of the conquest. The entrance of the cave faces outward to a rock outcropping, Roque Bentayga, which was a symbol of spirituality in prehistoric times. The rock was thought to cause the clouds to form rain and was important in fertility rituals performed to assure the success of crops. Left: Inside Santuario de la Virgen de la Cuevita. The image of the Virgin and Child stands above an altar and pulpit carved out of rock to match the cave.